Day 2 at CinemaCon included a panel from Warner Bros., presenting their upcoming slate for the year, which included the first footage from the highly-anticipated Aquaman, which hits theaters in December. Director James Wan was joined by Jason Momoa (Arthur Curry/Aquaman) was joined by co-stars Amber Heard (Mera), Patrick Wilson (Orm the Ocean Master) and Yahya Abdul-Mateen II (Black Manta) to discuss the film and present the first footage, although that footage has not been made public at this time. While it remains to be seen if and/or when we'll get to see the footage shown to the CinemaCon exhibitors, we do have a description below. The panel was emceed by Will Arnett, who Jason Momoa said is the, "best f---ing Batman," referring to the actor's voice role as the animated Batman in 2014's The LEGO Movie and last year's spin-off The LEGO Batman Movie. Director James Wan told the CinemaCon crowd that he, "didn't want to bring anything today, but they made me," which falls in line with the filmmaker's social media statement last month where he told fans that he hasn't put out a trailer yet because he wants to wait until the VFX are ready, stating, "I refuse to put out anything that might be construed as subpar." Wan also made it clear to CinemaCon attendees that the footage they were shown was not an official teaser and just a work in progress. The footage showed off the incredible strength of Aquaman, as he pulls a submarine out of the water, and fans also got a glimpse at a young Arthur Curry/Aquaman, who is seen catching a trident with his bare hands. Mera was also seen asking for Aquaman's help, telling him that, "Unless you help us, millions will die," while Orm the Ocean Master is seen saying, "There is a war coming to Earth and I'm bringing the Seven Seas with me." 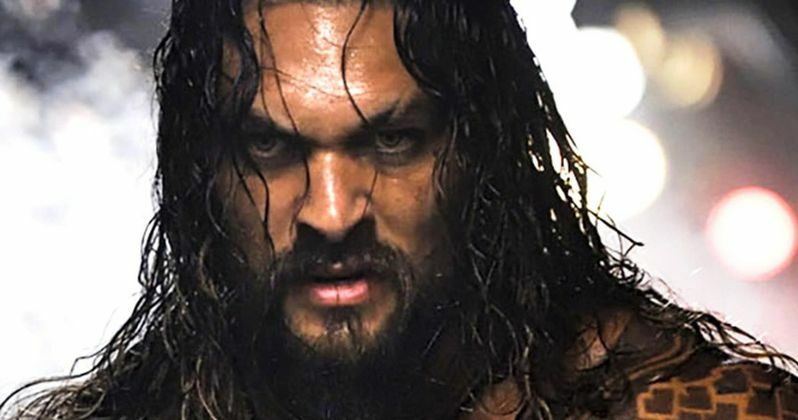 The story will largely follow Orm's quest to overthrow his brother Aquaman from the throne of Atlantis, while also giving Momoa the chance to deliver one-liners like "I'm a blunt instrument and I'm damned good at it," which was seen in the trailer. The trailer also featured a number of glimpses at Atlantis itself, with Orm seen in an Atlantis coliseum as he gets the crowd riled up in his bid to take over as the new king of Atlantis. Neither Wan nor the cast members would reveal when a proper trailer would be released, but there's still plenty of time, with just under eight months left until the December 21 release date. As of now, Aquaman finds itself in the midst of a jam-packed holiday frame, opening against 20th Century Fox's Alita: Battle Angel, Paramount's Bumblebee and Sony's Holmes & Watson, with Disney's Mary Poppins Returns also arriving on Christmas Day. Last year's Wonder Woman seemed to get the DCEU back on the right track, both from a critical and commercial standpoint, but all of that good will was seemingly tarnished by the release of Justice League in November, which was the lowest-grossing movie of all the DCEU outings thus far, despite bringing iconic heroes together such as Batman, Superman, Wonder Woman, The Flash, Cyborg and, of course, Aquaman. You can head over to Deadline for their report on the Aquaman footage from CinemaCon.